Should You Hire for Cultural Fit over Competence? A few days ago, I stumbled upon a video of Zappos CEO Tony Hsieh. It was a clip from an interview. In the video, Hsieh said that in Zappos, they would ‘fire those who don’t fit in their company culture’ even if they’re star performers. Tony Hsieh of Zappos is not the only one who does this. Venture capitalist Brad Feld is also a believer of the cultural-fit-over-competence school of thought. They both believe that cultural fit trumps competence. What is “cultural fit”, anyway? Although, as Furnham goes on to discuss, fit is not only about the person and the organization — fit to coworkers and supervisor is also of importance. There is no denying that cultural fit is important for hiring managers. A study published in the American Sociological Review shows that there is an increasing number of companies making hiring decisions that “more closely resemble the choice of friends or romantic partners”. Moreover, Logan Hill of Bloomberg Businessweek says the trend is leading to job interviews that focus as much on whether a candidate prefers Stars Wars or Star Trek as they do his or her actual qualifications. I can’t help but ask: Could Zappos’ approach be effective elsewhere? Are the majority of hiring managers really comfortable with the idea of passing over superstars in favor of less talented candidates who feel like the right match? Cultural Fit, Why Does It Matter? Back in 2005, Amy Kristof-Brown, Ryan Zimmerman, and Erin Johnson of the University of Iowa College of Business conducted a meta-analysis of extant studies on cultural fit. A meta-analysis is a type of statistical procedure which achieves considerable power by combining the findings of a large number of studies on the same topic. Their findings are congruent with most studies on cultural fit. They reported that employees who fit well with their organization and co-workers had greater job satisfaction, identified more with their company, were more likely to remain with their organization, were more committed, and showed superior job performance. Studies of cultural fit across many countries have also found a relationship between cultural fit and mental and physical health — so if your job fits your personality, you’re less likely to exhibit signs of depression, anxiety, and the like, and you might live longer. But must cultural fit always trump competence? Should our emphasis on cultural fit be enough to turn away a potential all-star? Not necessarily and not always. Feld and other proponents of this school of thought believes that it’s desirable to always strive for candidates with both high cultural fit and high competence but when faced with the tough choice of choosing between a candidate with high cultural fit and medium competence and a candidate with medium cultural fit and high competence, choose the one with the high cultural fit. The key is to strike a balance. Proponents of the cultural fit school of thought argue that an employee who fits well with the organization is more likely to work well with others and to continue to build their skills with the organization. On the other hand, an employee who fails to fit within your work environment is more likely to leave for another company that is more aligned with their own values. Empirical evidence attesting to these assertions is aplenty. It is important to note, however, that the importance of cultural fit is much more critical to expansion-stage recruitment success. It means that for startups and firms in growth-phase, culture matters a lot. Startups live and die by the quality of their people. It’s as simple as that. For instance, venture capitalist and blogger Fred Wilson says cultural fit can be the difference between a startup succeeding or imploding. As Wilson writes in a post on his blog, growing companies all encounter roadblocks and obstacles at some point in their development. And if a company is full of mercenaries with no shared culture or values, the team will struggle to survive. Sure, if a company has a choice of two candidates who are both very talented, but Candidate A seems to embrace the company’s mission and values more, I can absolutely see the company going with Candidate A. But what about if Candidate B is a superstar whose skills and capabilities are head-and-shoulders above Candidate A? Is it still smart to turn Candidate B away, and make a hiring decision based solely on cultural fit? 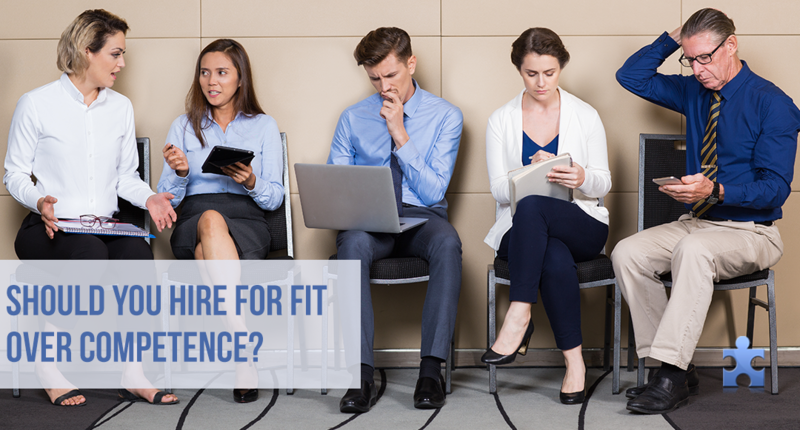 The dilemma surrounding the question “Should you hire for cultural fit over competence?” should not revolve solely around the proposition that – all other things reasonably equal – cultural fit trumps competence. The more important question hiring managers must ask is WHEN and HOW: When does cultural fit outweigh competence? And, how must you determine fit? Ultimately, it is more important for expansion-stage companies to find a golden mean between hiring candidates who possess the top-tier talent and those who will truly fit into your company culture. Of course, for bigger enterprises, the picture becomes a little more complicated. And that’s a story for another time. Nevertheless, instead of focusing on whether potential employees are going to conform to your company’s culture, focus instead on determining whether they are likely to succeed with working with you and your employees or will support or change your company’s values in a positive way. Yes, it is tough to determine fit. But you must remember that, in the end, you’ll find that a highly skilled employee who is not a cultural fit could be a huge detriment to your company, and a candidate who is not as highly skilled and is a great cultural fit could be your best hire. Schofield, K. and Schofield, A. (2013). Cultural Fit in the Workplace: How Personality Affects Hiring and Teamwork. [online] ERE Media. Available at: https://www.eremedia.com/ere/cultural-fit-in-the-workplace-how-personality-affects-hiring-and-teamwork/ [Accessed 2 Mar. 2017]. HR in ASIA. (2017). Hiring for Cultural Fit: Do You Think You Can Change How People Really Are? – HR in ASIA. [online] Available at: http://www.hrinasia.com/general/hiring-for-cultural-fit-do-you-think-you-can-change-how-people-really-are/ [Accessed 2 Mar. 2017]. OKRs and Continuous Performance Management | 7Geese. (2013). Hiring For Cultural Fit: Why it’s Important and How to Go About It – OKRs and Continuous Performance Management | 7Geese. [online] Available at: https://7geese.com/hiring-for-cultural-fit-why-its-important-and-how-to-go-about-it/ [Accessed 2 Mar. 2017]. Schofield &rarr;, V. (2016). Culture Fit in the Workplace: What It Is and Why It’s Important. [online] Good&Co. Available at: https://good.co/blog/cultural-fit-in-the-workplace-what-it-is-and-why-its-important/ [Accessed 2 Mar. 2017]. Feld, B. (2012). Why you should hire for cultural fit over competence. [online] VentureBeat. Available at: http://venturebeat.com/2012/12/18/cultural-fit-over-competence/ [Accessed 2 Mar. 2017]. Feld Thoughts. (2012). Hire For Cultural Fit Over Competence – Feld Thoughts. [online] Available at: http://www.feld.com/archives/2012/12/hire-for-cultural-fit-over-competence.html [Accessed 2 Mar. 2017].